send us an email and we will inform you when or if available again. Feel free to link to description and images of this ring. 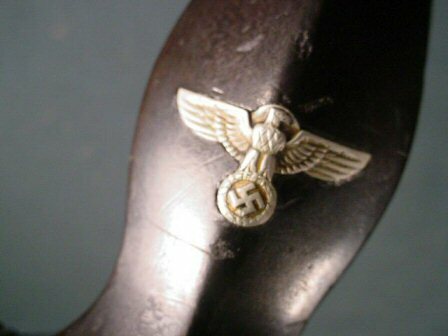 DESCRIPTION: Here is an extremely fine Model 1933 SS enlisted man’s dagger by Rich Abr. 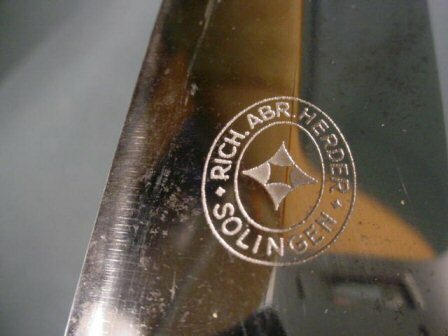 Herder Solingen. 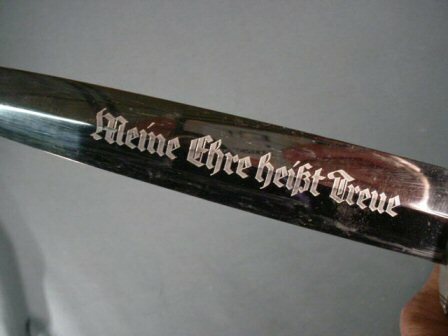 This is as issued or purchased with fine ebony grip in fine condition and nickel mounts. 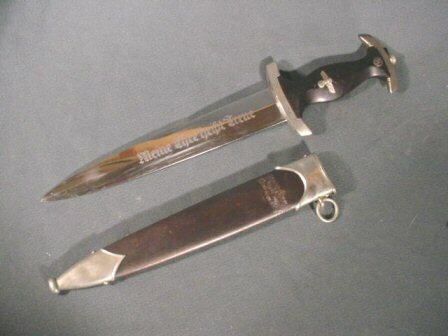 The dagger is not in mint condition, but if it were a rifle we could call it “NRA excellent!” The tiny dent to the scabbard tip is barely noticeable. The minute dents here and there on the ebony wood is only perceived in very close inspection. The blade borders on mint and it fits the cross guards with no discernible space whatsoever. This is an early production example evidenced by the design of the Herder logo style. The usual shrinkage of the wood at the cross guard is perceivable only on very close inspection. 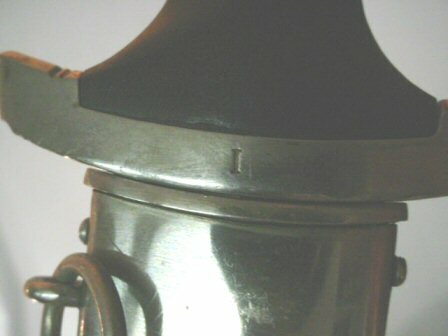 The Roman numeral ‘I’ is stamped into the reverse cross guard. This refers to the Abschnit or SS district. 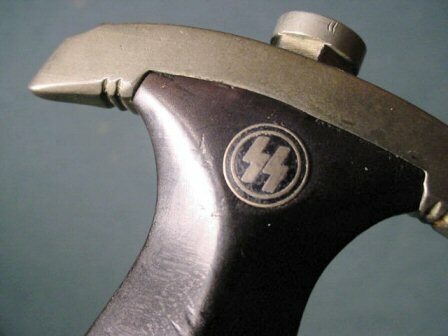 The vertical hanger is of the post-November 1934 pattern as ordered by Heinrich Himmler and is suspended in the fixed vertical position as prescribed. It is the coffin-shaped style. 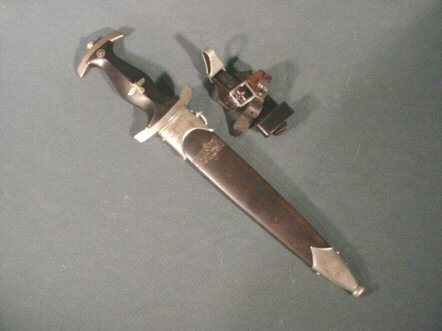 See Wittman’s Exploring the Dress Daggers of the German SS, pages 591 through 600 with special attention to page 596, bottom picture. 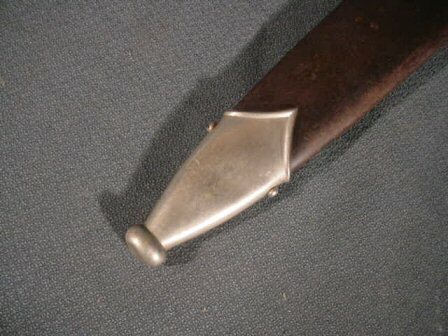 This fine specimen is marked inside where the scabbard would cover it. 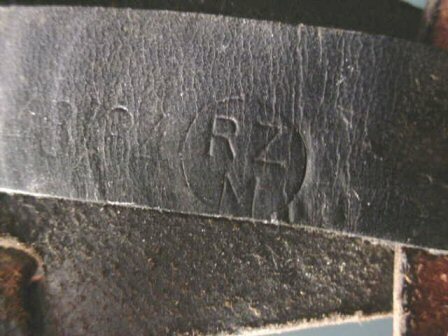 There is ‘SS’ in a circle followed by ‘4834 RZM’ in another circle. 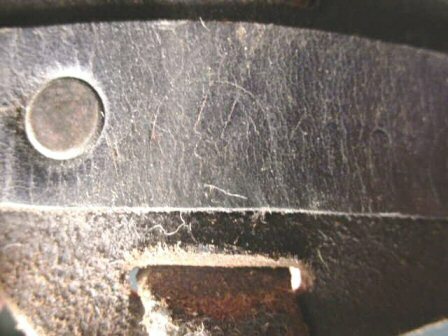 The Assmann nickel snap clip is marked with the ‘DRGM’ stamping (patent protected). 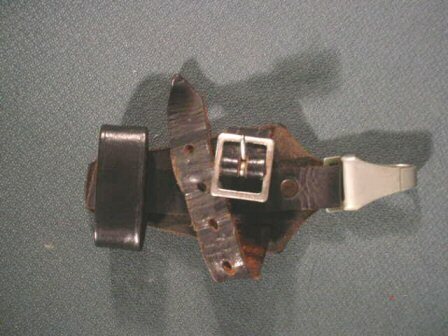 See the above book by Wittman, page 599, right top of page for explanation of the numbers on this Assmann hanger. The scabbard is anodized as the early ones were. The finish is slightly dotted as is usually the case with tiny abrasions, but again, only noticeable under very close scrutiny. 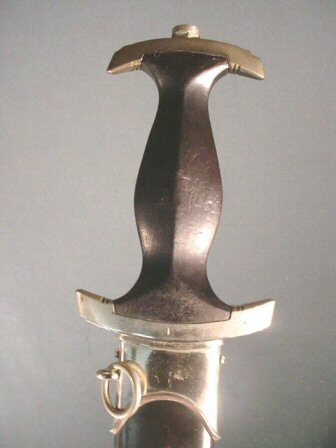 All in all the scabbard is very fine, also. 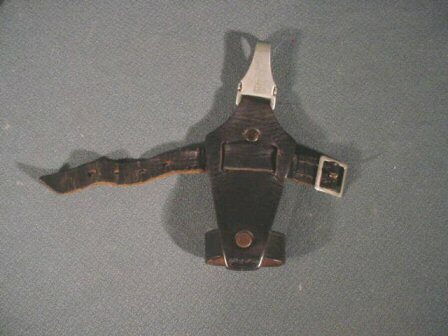 There is a noticeable thin band of wear about one inch down from the scabbard throat caused by the strap of the vertical hanger after 60-some years of its just being there, but also from its original wear by the former owner. 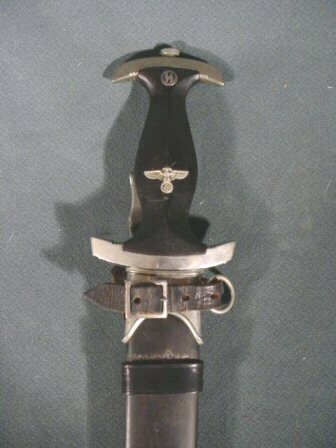 What we offer here is a magnificent example of the most sought after dagger of the Third Reich in fine overall condition. Honest, unfooled with, all original and early! You almost could not wish for a better specimen. 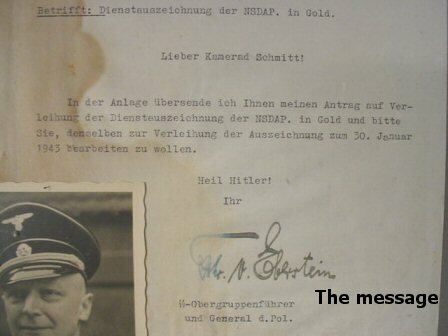 DESCRIPTION: This is a document awarding the long-service medal of the NSDAP in gold to a man whom Eberstein refers to as Kamerad. This was drafted June 19, 1942. 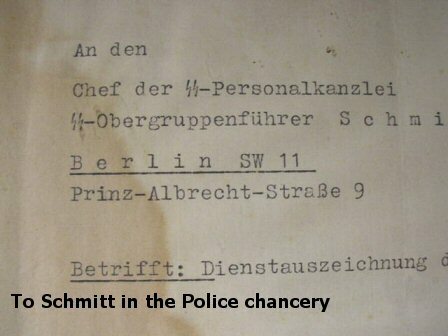 This Schmitt gentleman was the Chief of the SS’ Personal chancery at the Prinz Albrecht Strasse (Gestapo HQ). 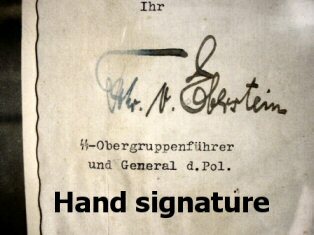 The letter is hand signed (boldly) by von Eberstein, who also proclaims “Heil Hitler.” There are some numbers and a word or two across the top in green pencil. 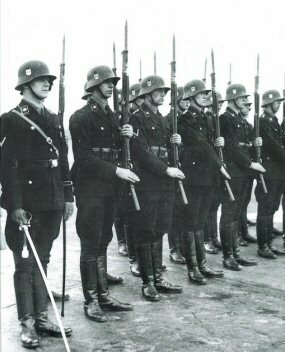 This was the style of Reichsführer-SS Heinrich Himmler??? 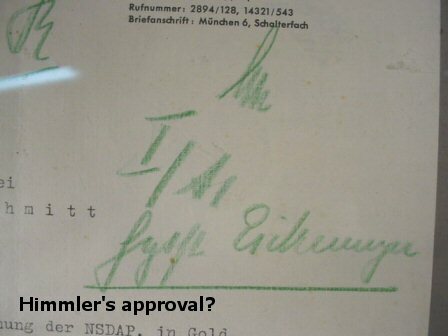 Could it be Himmler’s approval? 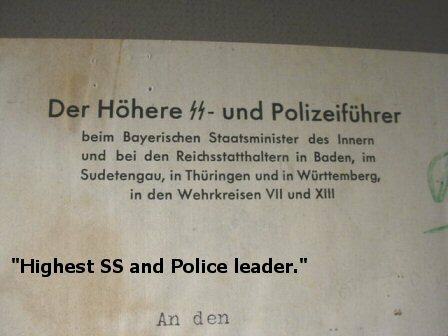 In the title it says the highest SS and police leader. 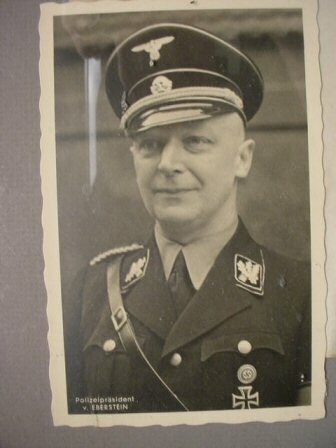 He also was the Bavarian State Minister of the Interior and also Baden Supetengau Thuringen and Würtemberg and a leader of the army (Wehrkreisen) VII and XIII; certainly one of the most important men of the Third Reich. The document is about ¼ stained and the “Fhr.” for “Freiherr is slightly faded to blue, but considering how rare the document is this seems acceptable. 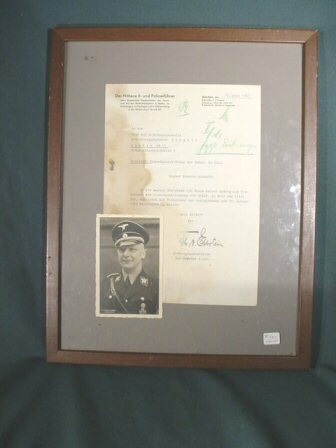 The document is framed and has a postcard photo of V. Eberstein attached. This is a very important document/letter and would be considered quite rare. The letter itself measures 11 ½ x 8 inches. The frame is 14 ½ x 18. Postcard measures 3 ½ by 5 1/2 inches.